« A.A. Luce on “The Fisherman,” by W.B. Yeats. Lately, in Idaho, the volume of debates about how best to address the decline of wild steelhead in the Clearwater River and connected waterways (or whether to address it at all) has grown significantly. This is a good thing, in my mind, though of course I wish there was no question we would make the necessary sacrifices to protect them. Some of the loudest voices in this debate come from guides and others whose commercial ventures focus on steelhead fishing. The Native Americans who have historically depended upon the steelhead and other anadromous fish are also rightfully vocal. Their dependence, I should emphasize, extends beyond their subsistence needs. Their cultural identities and spiritual lives are also tied to the fish. Most tribes pass down ancient stories in which this dependence is established, via agreements with the fish or their creator, that humans will care for the fish in return for the latter giving their lives to humans. The resulting reciprocal relationships feature heavily in ceremonies and other practices. The revered Nimiipuu (Nez Perce) elder Elmer Crow, explained this in a short film he made for Idaho Rivers United. The Clearwater, as I’m sure many readers know, flows through the Nez Perce Reservation. We rarely hear Non-Native fishers describe their relationship to salmon and steelhead as spiritual. 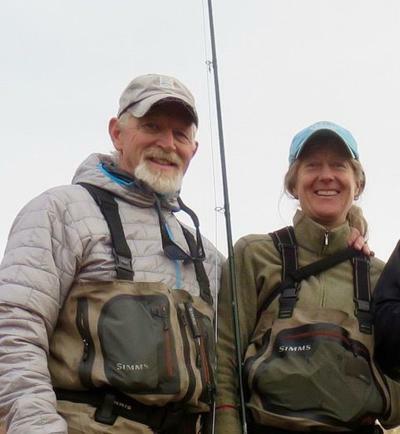 Yet, an Idaho angler and guide named Jerry Meyers did just that in a column, entitled “A Spiritual Loss,” for the Idaho Falls Post Register this fall. I have posted the column in its entirety below, and I urge you to read it. I am an Idaho salmon and steelhead angler edging into my sixth decade. What I am witnessing this year feels uncomfortably similar to the despair of the mid-1970’s and early 1990’s. Wild steelhead and Chinook salmon counts are back near their desperately low post-dam-building numbers. Having spent 40 years advocating for wild fish in Idaho rivers, it can be depressing to yet again be wading into the same turbulent political and economic waters. The current discussion about Idaho’s salmon and steelhead future is centered largely on costs related to loss of fish and fishing opportunity, loss of electricity, loss of commodities transportation via barging, loss of biological diversity and loss of habitat. Much less discussion is taking place regarding the spiritual value of these fish and related spiritual values that fishing opportunity provides to Idahoans like my family. What part of ourselves would be lost if salmon are allowed to slip away? Perhaps older white guys like myself should not be engaged in attempting to explain the spiritual significance of what these fish mean. After all, our Native American brothers and sisters have taken on that role since Euro Americans first laid eyes on the inconceivably bountiful runs of the Northwest. While it would be difficult for me to understand and accurately interpret Native Americans’ relationship to salmon, let me attempt to explain the spiritual relationship I have to these fish from the sea, and why wild steelhead are such a bone-deep part of our lives. My parents were small Palouse-area farmers and ranchers who worked very hard to give their five kids a decent upbringing. Decent upbringing included understanding our responsibility to the land, have respect and awe for wildlife, wild places and respect for others. My parents were generally in favor of building the Port of Lewiston and the four lower Snake River dams which made a seaport in Idaho possible. Their wheat got to Portland cheaper on barges and so each bushel we took off the farm became that much more valuable. More in the bank to feed and clothe a family. Crop transportation costs still remain the main economic issue for farmers when it comes to barging grain to Portland. But farmers do not pay all the actual costs of barging. The taxpayer also contributes significantly by subsidizing the economic and environmental costs associated with the lower Snake dams. I saw my first steelhead as a young lad walking along the creek that ran through our ranch. Seeing a fish the size of my leg which appeared like a ghost in a small turbid pool was one of those life-altering events. When my Dad retired from farming and cattle ranching, he again took up steelhead fishing on the Clearwater River with a zealot’s focus. Free from the time constraints that farming and child-rearing require, he spent days, often by himself, chasing steelhead. I still cherish those too few days when we fished together and talked about many things that we had only argued about in the earlier, trying years of the 60’s and 70’s. Fishing was the neutral zone. I took my future wife steelhead fishing with Dad in the late 70’s, and we landed four steelhead that day. We started our own river guiding business in 1982 and started our family a year later. Our two kids were largely raised on the river and became guides as soon as they reached 18. We fished together constantly, commiserated during the low-fish-run years and celebrated the stronger runs. Fishing fed our family both directly and indirectly through guiding wages. Our five grandkids, all under age 7, are already steelhead fishing veterans. Nothing excites them more than watching steelhead spawn in our nearby creek. They too are gaining a passion for wild creatures and wild places. Our story is not that different than many Idaho families who also share our passion for fishing, hunting and exploring Idaho’s special places. I can’t fathom an Idaho that no longer has wild steelhead nor the collective will to fight to protect them. I struggle to find words to accurately describe to others what these fish mean to us. How do we defend a spiritual need for wild things within an economic argument? We simply cannot assign a value to that innate part of ourselves that needs wildlife and wild fish, and we should never attempt to do so. Salmon have been a part of the Northwest for many thousands of years, and I cannot conceive that within my lifetime we have gone from relative abundance to near extinction. I find my faith in places where wild steelhead swim. It is here, in those places, that our family experiences beauty, an appreciation and empathy for those creatures nonhuman, a sense of humbleness in a natural world of which we are just a part. If we lose wild steelhead and salmon, we lose a part of our connectedness to our Creator, because our family believes they are part of the same. Jerry Myers was born and raised on a farm/ranch near Genesee, Idaho. He has been an licensed Idaho river and fishing guide since 1977 and, with his wife Terry, has lived on the Salmon River for 40 years. This entry was posted on December 9, 2018 at 11:00 AM and is filed under Fishing and Religion, Fly Fishing, The Environment. You can follow any responses to this entry through the RSS 2.0 feed. You can leave a response, or trackback from your own site. While this may not be entirely germane, the recent hue and cry among fly fishers over the threat of an early closure on the Clearwater reminded me strongly of the outrage over Silver Creek a couple years back. When the Purdy family collaborated with the Nature Conservancy to improve the habitat in Silver Creek, a lot of fly fishers hit the roof. Evidently, for many fishers the status quo is a combination of sacred cow and security blanket, and clearly any short-term sacrifices to ensure long-term benefits are unacceptable. Like a river, time runs only one direction. In my experience, it is always better to face downstream and pick your own course, otherwise bad things happen. I very much agree with both Geirach (great quote) and you.